Add the feel of spa luxury to you everyday life with this stunning Lualoha Classic Turkish Towel Blanket. So versatile it's worth every penny. Obviously, you can use this towel blanket after the bath, on the yacht, and at the beach, pool and spa. But this large size towel has plenty of other uses as well! Wear it as a sarong; use it as a blanket; sport it as a wrap when you're cold; lay it out as a picnic blanket or table cloth. Impress your guests by using your towel as a couch throw or as a decorative towel in your bathroom. The options are endless! 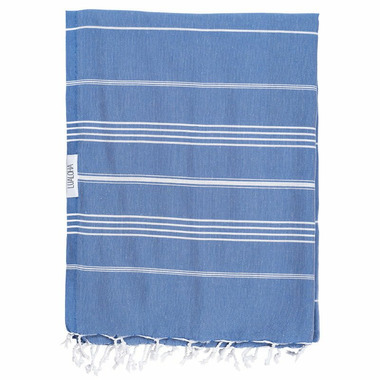 This flat-woven, 100% Turkish towel blanket is super soft, unbelievably light weight, ultra-absorbent and so quick to dry (just give it a snappy 20 minutes in the the sun or wind) that you'll instantly fall in love. And the best part is that it only gets softer and more absorbent after each wash. Whether you're a swimmer, a tanner, a surfer or a camper, your multipurpose beach towel will become your ultimate outdoor companion. Sleek, bold and sophisticated, this luxurious Lualoha beach towel will surely catch the envious eyes of all those "other" towel users on your outdoor adventures.